Around the tree, dwells the holy land of Bodhgaya which is primarily associated with Buddhahood, the ultimate awakening. An epicenter of Buddhism, Bodhgaya is the revered city which witnessed the transformation of a wander ascetic-prince to Buddha - the awakened one. Under the holy Bodhi Tree, Prince Siddhartha meditated for three days and nights and on full moon night became enlightened. Famous teachings of Middle Path or Eight-fold path also owe their origins to Bodhgaya. In fact, if we may say that Bodhgaya was the turning point in the life of Buddha, then we are not wrong. The serene surroundings were, now and will be the great location for meditation and contemplation. 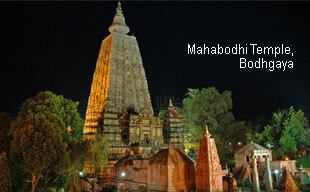 Mahabodhi Temple- Known to the world as a heritage site, Mahabodhi Temple is the spiritual centerpiece of Bodhgaya which is deeply connected to Lord Buddha’s life and teachings. Apart from its religious associations, the temple is a great example of Asokan architecture. Built entirely in brick, the temple’s sculpted stone balustrades are an outstanding early example of sculptural reliefs. Mahabodhi Tree Almost every Buddhist devotee wants to sit under the shade of Bodhi Tree. Just to experience the spiritual calm, surrender and awakening as Buddha himself experienced 2600 years ago. Botanically a Banyan Tree, Mahabodhi Tree shelters every spiritual soul under its soothing shade. Presently, the fifth generation of the original tree blesses the center of spirituality. Vajrasana - Vajrasana is another sacred site in Bodhgaya where Lord Buddha sat in meditation and achieved enlightenment. Monasteries - Monasteries or Viharas form an important base to explore unique traditions of Buddhism uniquely associated with the different countries. Almost all Buddhist countries have their representative monasteries built in their own distinctive styles enshrine their presence in this holy land. Belonging to countries like Thailand, Burma, Tibet, Japan, China, Sri Lanka, Bhutan, Vietnam, Nepal, Korea, Taiwan & Bangladesh, these monasteries also form an important aspect of Bodhgaya Tour. These monasteries also serve as host to many pilgrims and are a spiritual abode to a number of monks studying in these religious centers of learning. By Air: Bodhgaya Airport is just 5 kms away from Mahabodhi Temple. By Railways: Located on the main Delhi Line, Bodhgaya can be explored on the famous Mahaparinirvana Express, a special train for Buddhist Pilgrims. Climate - Pilgrims start to flock towards Bodhgaya from the beginning of September till March in Bodhgaya. Gaya - Devoted to Hindu tradition, Gaya marks the site where ancestral worship takes place for the peace of departed soul. Located just 5 km away from Bodhgaya, this place of worship gets a lot of footfall during Pitrapaksha, the time slotted for this worship. 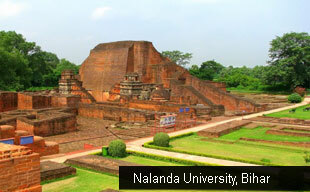 Nalanda - An ancient center of learning, Nalanda was one of the glorious achievements of India. It was the first global university in the world where students from countries like Tibet, China, Greece, and Persia lived, studied diverse subjects and acquainted themselves with the Indian wisdom. During its celebrated yeares, Nalanda University was actively visited by Lord Buddha and Lord Mahavira, founder of Buddhism and Jainism. Present day Nalanda is survived by its ruins in red bricks. Rajgir - This site in Nalanda district is also closely related to Lord Buddha himself. Rajgir, the royal mountain was one of the favourite places for Gautama Buddha. He used to meditate on Vulture’s Peak or Griddhakutta. This religious site also witnessed the First Buddhist Council after Buddha’s nirvana. The Buddhist heritage of Rajgir comprises Bimbisar's Jail, Ajatshatru's Fort and Jarasandh's Akhara. The peace pagoda, Vishwa Shanti Stupa is one of the recent contributions to the peace and calm of Rajgir. The famous hot water springs or Brahmakund also form an attraction for pilgrims, both for Hindus and Buddhists. Kesariya - The small city of Kesariya seems to have gained the importance of being one of the prime centers of Buddhism. Famous as Kesaputta during the Buddha times, Kesariya hosts the largest stupa in the world, built by Emperor Ashoka. Varanasi - Varanasi is one of the spiritual cities of India where rituals, tradition and religion form the backdrop of daily life. Devoted to Lord Shiva, this city is one of the oldest living cities in the world. 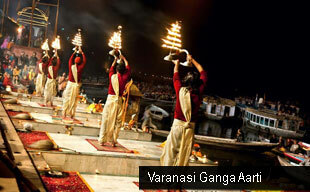 Famous for Ganges River and its mystic ghats, the city is also associated with the glory of Buddhism. One of the Four Pilgrimage Sites, Sarnath is just 13 km away from Varanasi. Famous for Deer-Park, Sarnath was the first site where Gautama Buddha taught the Dharma and the teachings of Middle Path to his five disciples. Pawapuri - Associated primarily with Jain religion, Pawapuri is also a holy pilgrimage where according to beliefs, all sins come to an end for a devout. Lord Mahavira, the founder of Jainism attained nirvana and was cremated at this place around 500 BC. It is said that the demand for his ashes was so huge that soil was removed from around the pyre to create a water tank. Present day Pawapuri hosts a majestic Marble Temple, Jalmandir in the middle of the tank. Another important Jain temple in Pawapuri is Samosharan, where the Lord Mahavira delivered his last teaching.